When Dan and I were first married, early in my entertaining life, artichoke dip was all the rage. In fact, I think it was the first dip I ever made. Well, it might have been the Seven Layer Mexican Dip. Have you ever heard of that one? Both are delicious and have stood have test of time. 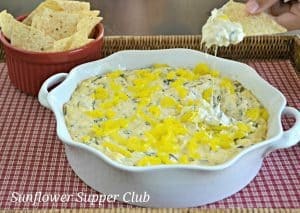 Over the years I have adapted the Artichoke Dip to suit my family’s taste. The original dip I made called for 1 cup mayo, 1 cup Parmesan cheese, and 1 can Artichokes. We have added spinach, but not too much. I’ve also built up the flavors a little with the addition of some other ingredients. I was going to tell you the Peperocini Peppers were optional, and I guess I can’t make you add them, but they are not optional in our family. I hope you will give our version of this famous dip a try! In a large skillet, melt the butter over medium heat. Add the onion and saute for a few minutes until soft. Add the garlic and continue sauteing for another minute until fragrant. Add the fresh Spinach and continue cooking until the spinach is cooked down and any liquid has about evaporated, about 4-5 minutes. Remove the skillet from the heat. Add the cream cheese, mayo, sour cream, artichoke hearts, hot sauce, Parmesan Cheese, Pepper Jack Cheese. Mix to combine. Spoon mixture into a baking dish. 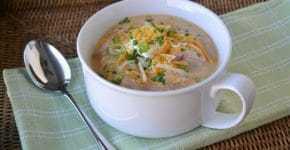 Top with extra Parmesan cheese if desired and Peperocini peppers. Bake at 350 degrees for 25-30 minutes. Serve with chips or pita/flatbread. We served it with chips, but usually I serve it with my pita/flatbread recipe that you can find here. We’ve linked this to Thursday’s Treasures hosted by Recipes for my Boys. Yum….you are a woman after my heart with all your lovely dip recipes. Thanks for sharing your creativity. Oh wow, yummy!! I could go for some of that right now!! !